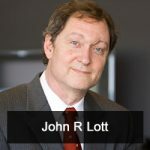 Today’s Flash Back Friday is from episode 28 with John Lott. Jason Hartman is joined by John R Lott to figure out if there’s any correlation between gun ownership rates and crime rates. Many people believe that more guns is a recipe for violence, but the number just don’t bear that out. John is author of The Bias Against Guns: Why Almost Everything You’ve Heard About Gun Control is Wrong; Freedomnomics: Why the Free Market Works and Other Half-Baked Theories Don’t; and Straight Shooting: Firearms, Economics and Public Policy. John is a gun rights advocate and believes we shouldn’t be trying to place restrictions on owning and carrying guns. Milton Friedman, noted Nobel laureate, dubbed him “The Gun Crowd’s Guru”.